This option uses the GPS data to check for errors in the accelerometer data, for the speed and position. The GPS data and the accelerometer data can be combined to produce the best quality track maps with smooth corners. Whilst the track map accuracy is improved, the mathematics involved to combine the accelerations and GPS data is quite complex and it takes some time to process the data into a track map. Race Technology products have GPS data sampled quite quickly (5Hz, 10Hz or 20Hz), so the advantage of combining the GPS and accelerometers can be quite marginal in some cases. This option can be used to try to clean up the track map when the GPS data is not very good. It can work very well on bad GPS data but should be used with care, this option relies heavily on the accelerometers being zeroed at the start of the run. If this option is enabled then the software processes the GPS speed and the acceleration data to get exactly the correct time alignment. This is done by shifting the GPS speed data back and forth by 1 second and seeing where it best “matches” the measured acceleration. Once the best match is found then all the GPS data is shifted using this information (this includes, speed, position, RTK attitude data, GPS time stamp etc). for this mode to work correctly the accelerometers should be correctly configured for alignment etc. this mode should not be used for short AX22 or SPEEDBOX data as this speed data is already correctly aligned. There are 2 ways for speeds to be calculated. In most cases the hardware stores GPS and accelerometer data, and the analysis software combines these to give speed. In some cases, noteably the SPEEDBOX, AX22, and optionally on the DL1PRO speed/distance is calculated in real time and stored. 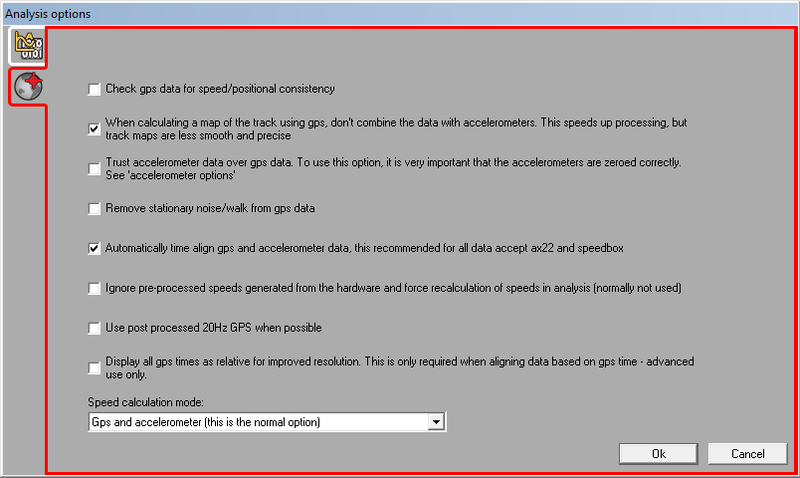 In most application the speeds that are calculated in real time are used in the analysis software, however if the unit was incorrectly installed or configured then it can be desireable to ignore the pre-calculated results and instead calculate them in the software from GPS and accelerometer data. A complete data stream from the GPS unit, this includes speed and position (as above) but in addition this also includes heading, gradient as well as all the raw unprocessed GPS measurements. This information is only available on DL2 and later DL1’s (from 2008 onwards). For many applications it doesn’t matter if you use the older “standard” mode, or the newer “raw GPS” data mode, however generally it is better to use the raw GPS data if it is available as this can potentially be more accurate and contains more channels of data. If you are unsure, then you can enable raw data and process a run, if the raw data is unavailable the software will display a warning. “Use post-processed 20Hz data”: This is a more advanced mode that uses the raw measurements stored during logging and the PC is used to convert these into speed, position etc. The advantage of using this mode is that the data is potentially significantly more accurate and the data is available with an true update rate of 20Hz. The disadvantage is that the data takes slightly longer to process. The vehicle speed in analysis can be calculated in a number of different ways, which can be selected from the option list. In most applications it is normally desireable to calculate speed from a combination of GPS and accelerometer data. GPS only can be useful in applications where the acceleretomer data was not useable for some reason, the most common being that the data was recorded on a boat, or the logger was not mounted correctly � for example maybe it was just resting on a seat and allowed to move about. In these cases using the accelerometer data will cause considerable inaccuracies. The other options use wheel speed to aid the speed calculations. For most applications this is less accurate than GPS due to problems of the wheels locking up and spinning under load, however in cases where the GPS data is poor using wheel speed is a useful option. Note that distance is calculated by analysis based on speed, so the options that you choose for speed with also directly affect distance. Speed and distance are also used on the position calculations, so again any problems in speed will impact the track mapping. VERY IMPORTANT: If you use wheel speed to calculate speed in the analysis software, but wheel speed is incorrectly configured, the results that you get in the analysis software will be nonsense. There is information on setting up wheel speed in the software here.